A movie tie in game that's great fun and captures the spirit of the movie? Yes, really. Immediately familiar to those who played Spider-Man games on the PS1, The Amazing Spider-Man isn't perfect but it does try very hard and provides a decent amount of fun. Following the storyline of the film, The Amazing Spider-Man should immediately hook fans. However, it's the open world mechanics that will keep players web swinging around for longer. 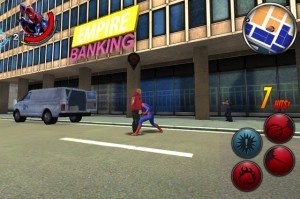 Like all the best Spider-Man games, console or iOS, The Amazing Spider-Man allows players to explore New York City by swinging around the rooftops. Besides the story missions, there's a plethora of side missions to pursue for fun and profit. Complete the side missions and gain more experience which can be used to upgrade Spidey's powers through an upgrade tree system. It's the kind of mechanics that will be immediately familiar to console games and it transfers across well. The only real failings are associated with controls and processing power. On the iPhone 4, The Amazing Spider-Man is a little sluggish at times. It's slower to load than most other titles and while web swinging across the city, there's a noticeable drop in framerate and some clipping. It might not detract from the enjoyment of the game too much, but it is a reminder that the iPhone 4 isn't quite as speedy as it once was. Controls are also not quite as effective and do require some practice. Web swinging is designed to be intuitive so that players swiftly learn to swap between the contextual buttons that appear on screen, but even with small hands, the buttons feel too small on screen. In time, I became accustomed to it but it still doesn't feel quite as natural as I'd have liked. Technical issues aside, The Amazing Spider-Man is still a very entertaining game. It captures the spirit of being able to swing from building to building admirably and there's a ton of places to explore. It's that rare treat of a fun movie tie in game.